So there have been changes to the garden gradually over that time and I have not recorded many of them until now. The Chicken Coop got a work over. New door, new roosts, new straw, new shiny black plastic to cover it up so Stella doesn’t crow so much in the mornings. Naughty chook. The Passion fruit delivered a lovely harvest and one of the trellis poles broke so the passion fruit was taken away and put into compost and another support put up, the ropes tightened and the new plant in waiting – a Panama Gold Passion fruit – was planted. It’s taken off already. In the bed underneath I have planted a garlic crop and some radish seeds. 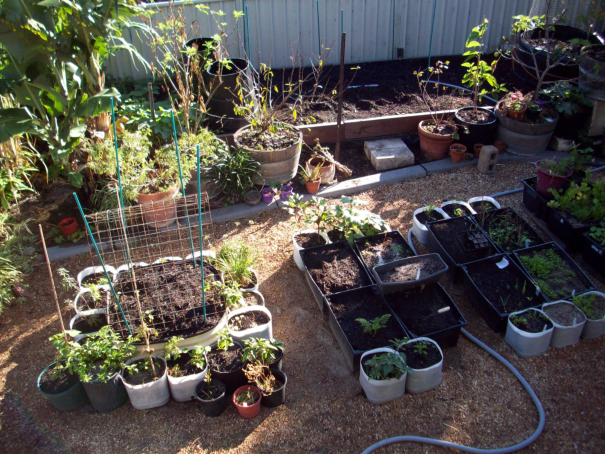 I have shifted all the fruit trees to transform the centre of the garden into a collective of tubs which I am growing salad greens and peas and herbs to make the most of the space. This way I am hoping to be able to plan ahead a little easier and at least get some things growing. With being preoccupied around Christmas and New Year and with our new little son there has been a huge gap in our harvesting due to not having planted seeds. A lesson learned. Make it easier. Having said that, it will hopefully be easier now that the main back bed is coming along. The Aquaponics system had a few moments of neglect but is now working well and despite the drab appearance of many of the plants through neglect it is starting to lift it’s game. I plan to plant lettuce and winter crops in it soon. I will need more fish however to keep the nutrient levels humming away. Pond – the watercress got a little burnt on top and flowered and seeded. I have ripped most of this off and within days there is always fresh, new, green growth. Amazing. Side gardens – the raspberries almost look dead after the last lot of dry, windy days. With the latest rains I think they will be fine for a bumper harvest in the coming fruiting season. The other two side gardens were abandoned over summer to minimise watering and because soil was being lifted from them for the compost bins. Tropical Garden hot spot – this was one of the first projects in summer. I re-potted many of my exotic plants such as babaco, pitaya (dragon fruit), mountain paw paw, lemon grass, curry plant. They are all doing well. One of the babaco has maturing fruit on it and smaller developing fruit higher up its trunk. The other finished fruiting from fruit set last March and now has new fruit forming on it also. Yesterday with the drizzle I decided it was time to plant the broad beans. I planted two patches. One of Aquadulce from last years seeds and a crop on top of the compost heap that is in the back garden also. These seeds are from pods left on the ground over summer at the community garden. They dried out, some got attacked by snails and the like, but with the recent moisture in the air (even before the rain) they were swelling up and retaining moisture. 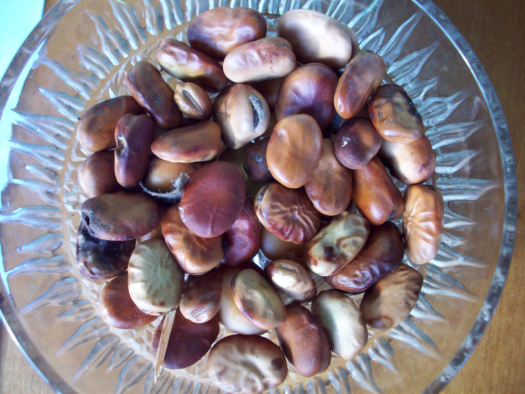 So they are really an experimental crop as they are more like a fava bean, whereas my own broad bean seeds are quite flat and large and paler in colour. I figured that if they were going to sprout soon just lying there as they were that it would be about right to plant my crop also. 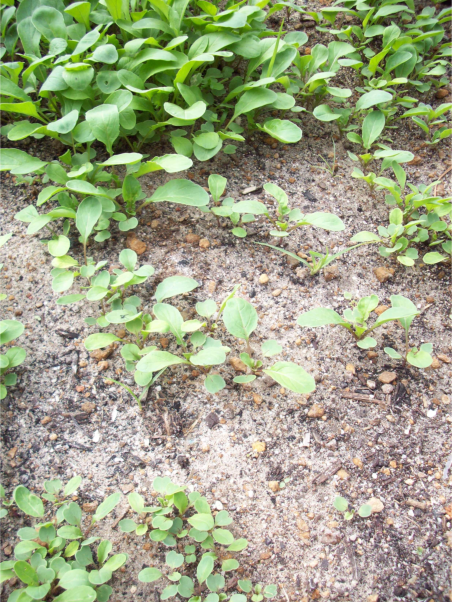 Several weeks back I planted seeds of spinach, beetroot, arugula, radish, broccoli and cauliflower. These are now all up and the spinach and beetroot were quite well advanced and healthy so I transplanted some of them today into other areas of the garden. 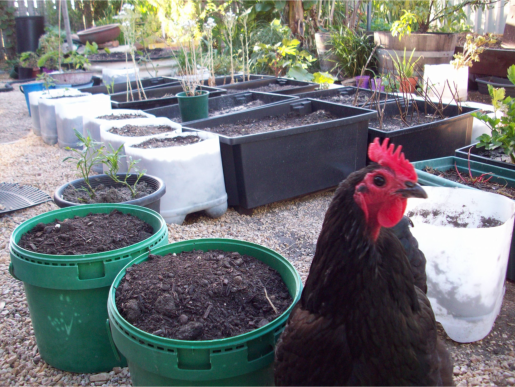 I have really sown lots of spinach and lettuce seeds as I want to be able to feed much more fresh greens to our chooks. More than they are getting at the moment. I am after an abundance of greens so they never have ‘dry spells’. The tub gardens that I have set up are basically worm farms. I have various materials in them. Straight sand from the garden and under the house, some soil amendment products, rock dust, kitchen scraps, old potting mix – that sort of stuff. The idea being that over the time they will break down and the plants can use some of the nutrients whilst the worms break down the rest which can ultimately be put into the back garden bed to enrich the humus there. Our guinea pig family is doing well. The little male boar that we had has gone to a friends farm to join some recently acquired male guinea pigs which are much older. The idea is that we can then keep sexes separate but can choose which pigs we wish to breed from. The two newest guinea pigs, Mother and daughter are much more inquisitive than Maiki and Jazz. They have taught them to explore further afield and try new greens. So their territory has opened up quite a bit now. The little one even ventures into the chook pen to get some food!